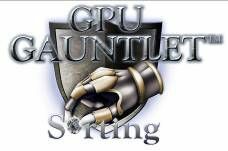 GIGABYTE’s innovative GPU Gauntlet Sorting process allows to select only premium GPUs for a use in GIGABYTE Super Overclock Series high-end graphics cards. 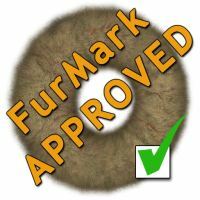 GIGABYTE uses FurMark and 3DMark Vantage in the sorting process. First, GIGABYTE’s database analysis system evaluates the GPU core engine, shader engine and memory. If a processor doesn’t meet the pre-defined standard, it will not qualify for the Super Overclock Series. In addition, GIGABYTE’s proprietary testing toolkit allows engineers to inspect and select the GPUs with the highest frequency. This program operates for 30 minutes and provides important data on the maximum overclocking ability when compared to a stock GPU. Once the Super Overclock point has been determined, engineers will boost the frequency to offer the highest factory default clock setting in the market. 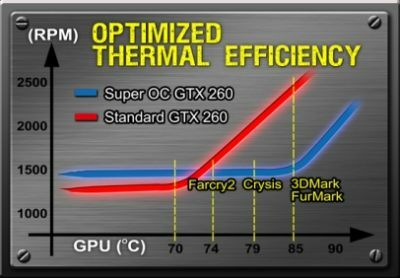 Next, each Super Overclock Series GPU faces the Graphics benchmarks, FurMark and 3DMark Vantage, to measure performance and stability under an intense graphics load. A GPU that passes this stage will perform at a lower temperature and fan speed compared to a standard GPU. By choosing the cream of the crop, GIGABYTE ensures rich rendering of intricate 3D scenes and realistic physical effects such as water, gas, steam, fire, etc for a lifelike gaming adventure. Last but not least, engineers test the power switching and stability. The GPUs with the best power efficiency and lowest power consumption qualify for the Super Overclock Series. And GIGABYTE understands that premium graphics cards should not sound like a cement truck rolling down the freeway, so a large cooling fan provides for a quiet computing environment. Thanks to Ultra Durable VGA 5 quality components, 2 oz copper PCB, first tier memory, Japanese solid capacitors, ferrite core cokes and low RDS on MOSFET, the Super Overclock Series provides for top performance in graphics benchmarking. These high-quality components promise consumers 5%~10% lower GPU temperatures, 10-30% higher overclocking capability, and switching power loss that is reduced by 10-30%. Proprietary database analysis system helps engineers investigate GPU core, shader and memory. Super Overclock Series video card sets its factory overclocked at optimal stability point (Super OC point), which is an exact balance between high frequency and efficient power consumption, delivering top performance for power users. With high-quality Gigabyte Ultra Durable VGA components, the processor selected by GPU Gauntlet™ Sorting boasts extra lower temperature by 5 to 10%. The guarantee fan speed at 1500 rpm in high-rated 3D and physics-accelerated games helps reduce noise for an absolutely quite environment. GPUs are examined and tested for the highest power efficiency and lowest power consumption using the FurMark and 3DMark Vantage benchmark. A Gigabyte GTX 260 Super Overclock Series graphics card delivers a 25% increase in performance compared to a standard GTX 260 card. 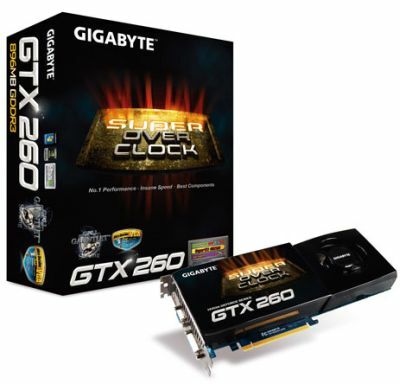 And a Gigabyte GTX 260 Super Overclock Series card guarantees the same overclocking capability as a standard GTX 260 dual-fan video card, but with lower power consumption. The first card in the Super Overclock Series is the GV-N26SO-896I, a GeForce GTX 260 graphics card with a 680MHz core, 1466MHz shaders and 896MB GDDR3 clocked at 2350MHz.